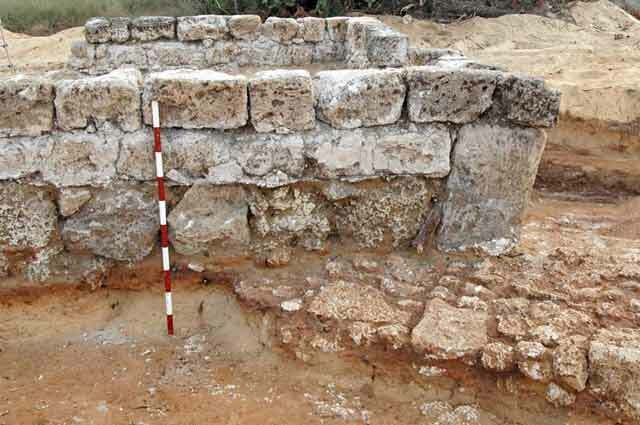 During August 2010, a trial excavation was conducted in Neighborhood 12 in Caesarea (Permit No. A-5986; map ref. 191355–547/710122–256), prior to development. 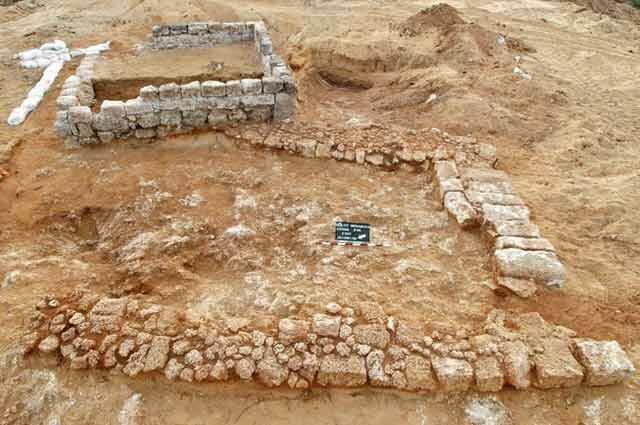 The excavation, undertaken on behalf of the Israel Antiquities Authority and underwritten by the Caesarea Development Company, was directed by P. Gendelman and A. Masarwa, with the assistance of Y. Lavan and R.Abu-Halaf (administration), R. Mishayev and M. Kahan (surveying and drafting), A. Peretz (field photography), M. Shuiskaya (pottery drawing), A. Gorzalczany (guidance) and M. Masarwa and K. Sa‘id. 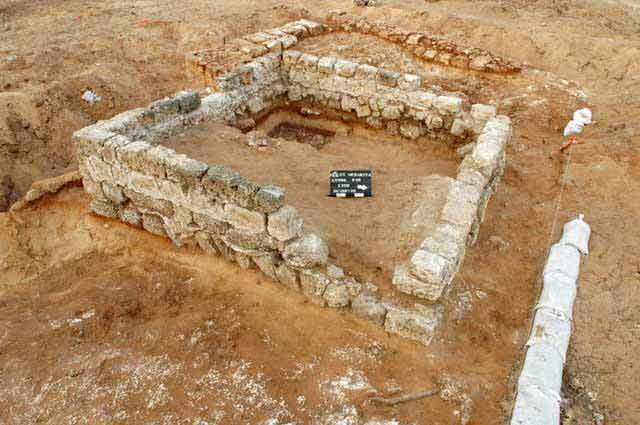 The excavation area was located within the precincts of the Caesarea antiquities site; it was covered with sand dunes and dense vegetation (Fig. 1). 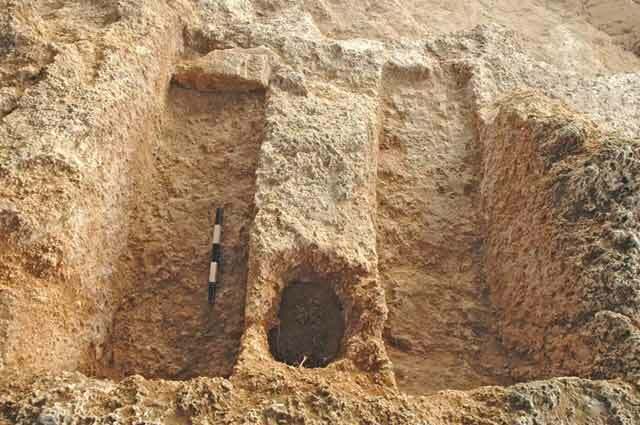 Remains of two buildings (F10) and four kurkar stone quarries (F20, F30, F40, F50) were exposed; four hewn tombs were revealed inside two of the quarries (F30, F50). One of the structures and the quarries dated to the Late Roman period based on ceramic finds. 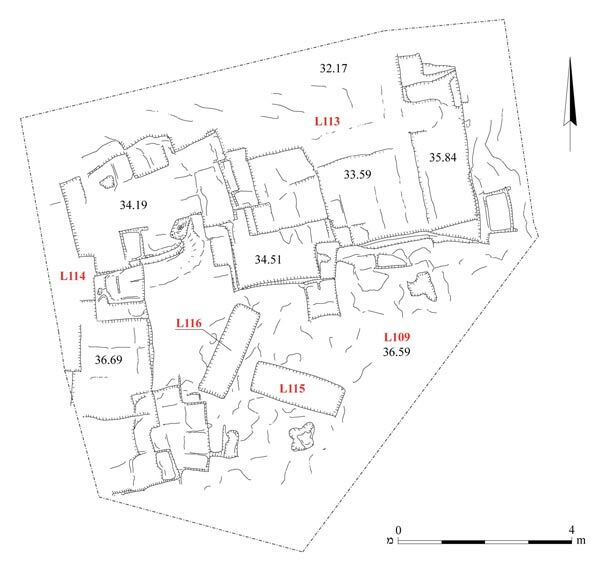 Remains of burial complexes, dating to the Roman and the beginning of the Byzantine periods (first–fourth centuries CE; ‘Atiqot 55:45–56 [Hebrew]) were exposed c. 200 m west of the excavation area in 1993. 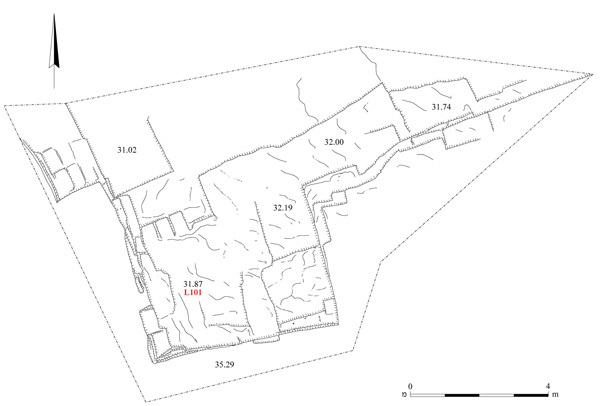 Remains of an aqueduct from the Byzantine period were exposed c. 1 km southwest of the excavation area in 2006 (HA-ESI 122). F10. Remains of two structures (1, 2; Figs. 2, 3) were exposed. The foundations of three walls of Building 1, set on the bedrock, were preserved (W14–16). Walls 14 and 16 were built of two rows of dressed kurkar stones (0.25 × 0.30 × 0.30 m) and a core of small kurkar stones bonded with hard hamra. Wall 15 was built of two rows of large ashlars (0.25 × 0.35 × 0.80 m); the outer row was set as headers and the inner row—as stretchers. A scant amount of worn potsherds that could not aid in dating the structure were discovered in the building. 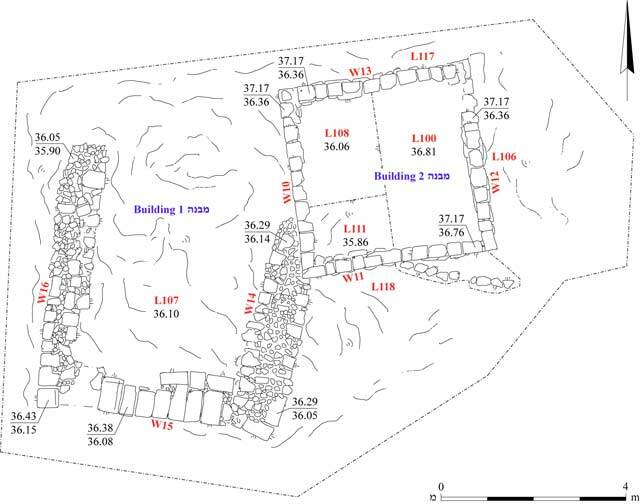 Building 2 was a square structure (3.6 × 3.6 m; Fig. 4) whose walls (width 0.3 m, preserved height 0.8 m) were built of dressed kurkar stones (0.20 × 0.30 × 0.35 m) bonded with hard hamra. Remains of thick gray plaster were preserved on the inner and outer surfaces of the stones. The walls were constructed on foundations built of kurkar stones and bonded with a thick layer of hard hamra. It is possible that the floor of the building was robbed in antiquity. The southwestern corner of the building was erected on top of W14 of Building 1; hence, it is clear that Building 2 postdated Building 1 (Fig. 5). Human bones and ceramic finds were discovered in the building, including a cooking krater (Fig. 6:1), amphorae (Fig. 6:2–4) and jars (Fig. 6:5), dating to the Late Roman period (third–fourth centuries CE). The residents of Caesarea in the Roman and Byzantine periods used to bury their dead outside the city walls, mainly in the kurkar hills and stable sand dunes that were unsuitable for farming. The cemeteries from these periods extend across an extensive area and they included different types of single and family tombs, among them graves dug in the ground, tombs hewn in kurkar bedrock, built tombs and tombs that combined digging, quarrying and construction. 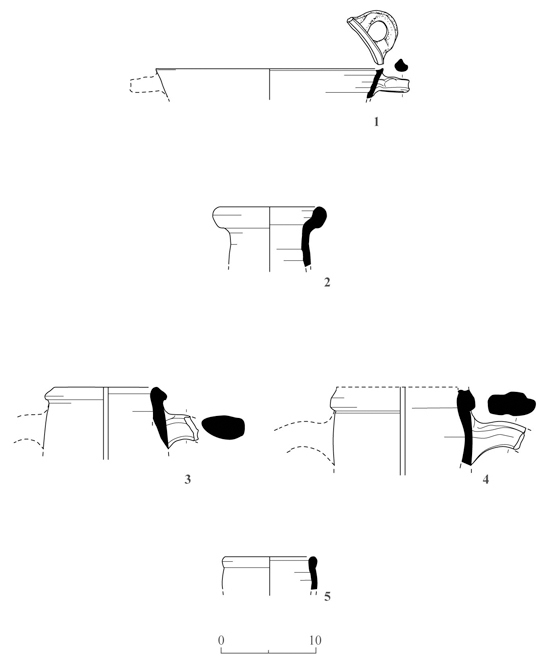 Based on an analysis of the artifacts and the construction method of Building 2, it is reasonable to assume that this structure was used as a mausoleum. F20. A quarry (104 sq m; Fig. 7) with four hewn steps and vertical sides was exposed. Several stones that were not completely hewn, nor detached from the bedrock, remained in the quarry. The quarrying marks indicate that medium-sized stones were quarried (0.25 × 0.30 × 0.40 m). On the bottom of the quarry was a densely packed layer of quarrying debris (thickness 1.4 m), indicating that the final dressing of the stones was done in the quarry. F30. A quarry (105 sq m; Fig. 8) with three hewn steps was exposed. The quarrying marks indicate that large stones (0.3 × 0.4 × 0.6 m) were hewn. Two rock-cut tombs were discovered inside the quarry. Their dimensions were similar (L115, L116; 0.73 × 1.05 × 2.70 m) and they had been plundered in antiquity. 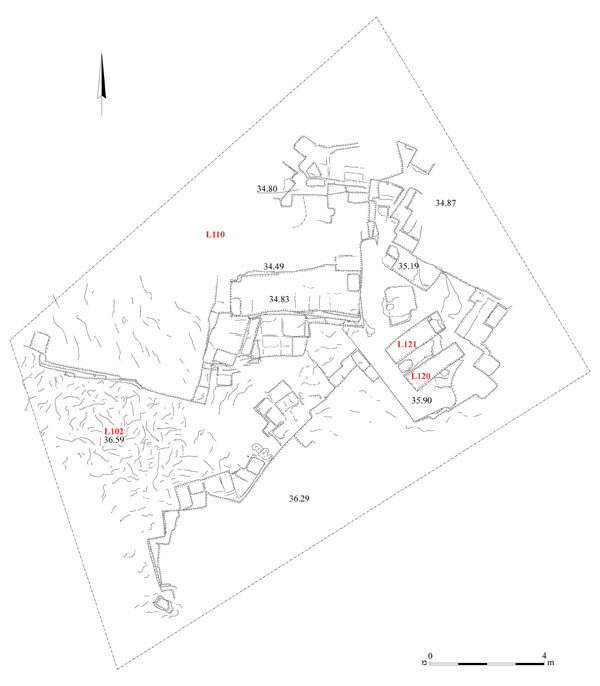 Tomb 115 was oriented east–west, whereas Tomb 116 was aligned north–south. The tombs were devoid of any finds. F40. A quarry (57 sq m; Fig. 9) with four hewn steps was exposed. The sides of steps in the southern part of the quarry were vertical. Numerous severance channels were discerned in the quarry. A layer of quarrying debris (thickness 0.5 m) on the bottom of the quarry indicates that the final dressing of the stones was done on the spot. F50. An extensive quarry (207.4 sq m; Fig. 10) with three hewn steps was exposed. The quarrying marks indicate that large stones were hewn (0.35 × 0.40 × 0.60 m). 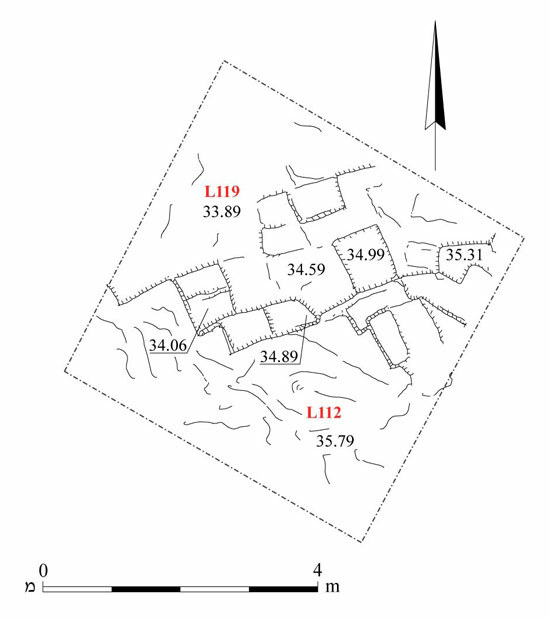 Two tombs (L120, L121; 0.54 × 0.60 × 2.01 m; Fig.11) were revealed inside the quarry. They were cut adjacent to each other, aligned northeast-southwest axis, and found devoid of artifacts. An installation for placing funerary offerings was exposed between the tombs. The pottery finds in the quarries included a terra sigillata bowl (Fig. 12:1), a cooking pot (Fig. 12:2) and jars (Fig. 12:3), dating from the end of the first century CE until the beginning of the fourth century CE. The tombs were hewn inside the quarries after they had ceased to be used in the Late Roman period, based on the ceramic artifacts. 3. F10, two buildings, looking east. 4. F10, Building 2, looking west. 5. Corner of Building 2 built on top of Building 1, looking east. 11. F50, the two tombs, looking east.